Real, compulsive and intense: Cat Clarke is the queen of emotional suspense. For fans of Paula Hawkins, Gillian Flynn, Megan Abbott and Jandy Nelson. Harper has tried to forget the past and fit in at expensive boarding school Duncraggan Academy. Her new group of friends are tight; the kind of girls who Harper knows have her back. But Harper can't escape the guilt of her twin sister's Jenna's death, and her own part in it - and she knows no one else will ever really understand. But new girl Kirsty seems to get Harper in ways she never expected. She has lost a sister too. Harper finally feels secure. She finally feels...loved. As if she can grow beyond the person she was when Jenna died. Then Kirsty's behaviour becomes more erratic. Why is her life a perfect mirror of Harper's? And why is she so obsessed with Harper's lost sister? Soon, Harper's closeness with Kirsty begins to threaten her other relationships, and her own sense of identity. 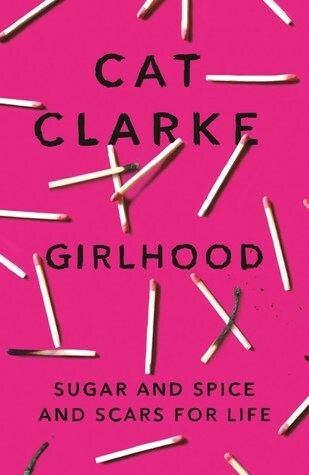 First Thoughts Cat Clarke + Boarding School + Female Friendships = instant magic?! My Review There has always been something enticing and captivating about a boarding school book in YA. Girlhood stands out with it's deep pink cover and chilling tagline: sugar and spice and scars for life. I was instantly drawn to the main character, Harper, who's personality is tinged with the remnants of her sisters death hanging on her shoulders - because her sister Jenna who died, was her twin, and ultimately when twins are separated by such tragic circumstances, it's unbelievably painful. But Harper has these friends; idyllic, lively and bursting with the kind of support that you'd kill for, and they have shaped the person she's become at the Duncraggan Academy. New girl Kirsty is like a magnet to Harper. They share a painful similarity, because Kirsty has also lost a sister. They click and find an unspoken connection and for the first time in a very long time, Harper feels like she's coming out of her shell and crawling back to the person she used to be. But then Kirsty suddenly changes, and it's getting under Harper's skin in the ways that Kirsty has become obsessive over Jenna - Harper's twin - and faster than she can contemplate, Harper is at risk of losing the people she cares about the most. She knows that the answer to finding out the truth is to climb out of the depressive cloud hanging over her head and find herself again through the mayhem. WOW. Just wow. Have you ever read a book and then just sat there and thought "how do I go on from here?". Girlhood is this book. I couldn't read anything for a day after, still enraptured by the story, the painful truth and compulsively addictive characters. Girlhood is a lighthouse in the darkness; bold and enthralling. The elements that I loved were the lack of romance (because it focused on more important things), but the implement of sexuality in Harper's case of being bisexual, and I think that Cat wrote this so honestly. Rowan was one of my favourite characters by far (you'll know why when you read Girlhood) and I loved the friendship that bonded the girls together - it's a breath of fresh air to see such a female driven friendship group in YA. Overall, Girlhood is a must-read, must-have and must-re-read over and over again. If you haven't got it in your hands, you're truly missing out on one of the best books of the year! I don't say it very often, but I wish I could give this six stars, or seven, or eight. A true epic read! Harper sounds like such a fascinatingly complex character. What inspired her personality? I wanted to write about a girl struggling to cope with grief, but just about managing to keep her head above water, with the help of her friends. Alhough there’s no romance in the plot, Harper is bisexual, and her best friend, Rowan, is a lesbian. I wanted to create a group of friends who weren’t all straight. On the surface of things, the four friends in Girlhood couldn’t be more different, but that’s partly what makes their bond so strong. I also wanted Harper to feel uncertain and anxious about leaving school. She’s in her final year, and everyone else seems to have their whole future figured out, whereas she doesn’t have a clue what she wants to do. I think that’s something a lot of people can relate to – I certainly can! What's your favourite thing about Girlhood in the sense of female friendships in YA? I especially love the moments of kindness and forgiveness between the girls. It makes me feel all warm and fuzzy inside 🙂 Friendship is one of my favourite things to read about in any book. Oh that’s a tough one. I’m inspired by news stories (not so much right now though, with the world being pretty much on fire!). Music inspires me a lot, as do books and films. Inspiration can come from anywhere – it’s about paying attention, and being open to it at all times. And finally, do you have any plans for future (surely amazing) books? I’m in the middle of writing my next YA, which should be out next year. And I’m also working on some non-fiction projects, and a top-secret project that I’m having a lot of fun with. I want to keep challenging myself with my writing, and hopefully keep enjoying the process. Want to listen to an empowered GIRL POWER playlist? I created this playlist on Spotify for all my Pretty Little Memoirs readers! Enjoy listening to these girl anthems! Let me know in the comments or at @LittleMemoirs on twitter, and use the hashtag #readGirlhood to join in!